A recent article in TheStar.com discusses how space may be the first frontier for the next major conflict. By major conflict I assume one in which the US is engaged with another world power and not the sort of massively asymmetric warfare we are engaged in in the Iraq & Afghanistan. Thinking through how a conflict might unfold – there are lots of scenarios that could potentially lead to the start of a shooting war between the major powers, such as China finally getting around to trying to “take back” Formosa (maybe they haven’t updated their maps to call it Taiwan..?) – the issue of how it starts is less relevant; what is more relevant is what might happen next. China’s ASAT “test” (some prefer to call it demonstration) where they blew one of their own defunct weather satellites into smithereens was IMO the modern day equivalent of what the US and USSR did back in the 50s and 60s before the test ban treaty – a show of force that “we have nukes, too” just in case the other side had somehow forgotten about the doctrine of Mutually Assured Destruction (MAD). Critics immediately decried the test/demonstration as irresponsible due to the cloud of debris that it immediately generated. 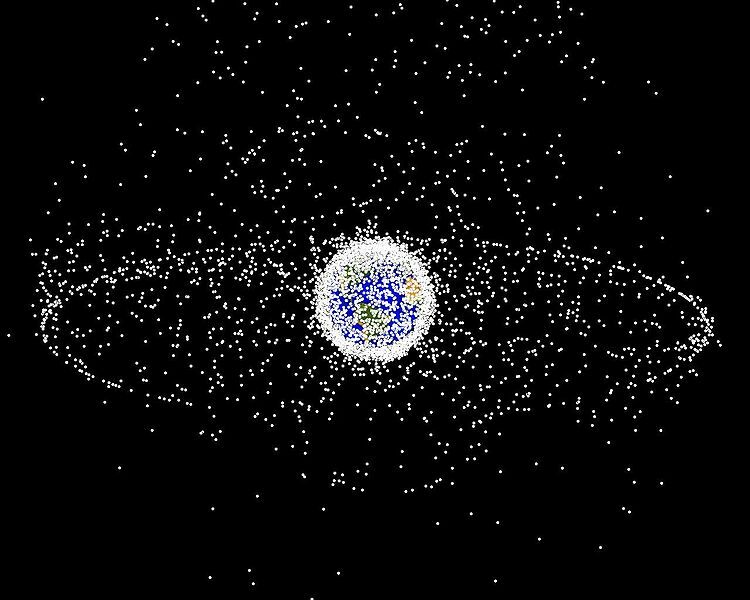 There are currently over 600,000 pieces of debris floating around the Earth according to ESA, the remnants of satellite launches, debris from collisions, the occasional intentional destruction a la the ASAT test/demonstration, etc. Our friends at NASA are currently tracking many of these to help keep our satellites, rockets, ISS, and astronauts safer. The problem is that, unlike MAD, this doctrine is not well known or possibly actually factored into policy thinking as it should be – the fact that we already have 600,000+ pieces of debris is clear evidence of our lack of foresight and planning when it comes to littering the space around our planet. But it is something that we must discuss now, in the context not simply of reducing debris from launches and other non-conflict-related space activity, but rather in relation to what might happen in a real conflict involving members of the space faring club on opposing sides (i’m going to ignore for the moment the scenarios of the “rogue nation” launching a nuke into orbit in some Dr. Evil-like plot to destabilize the world). If we were to get into a shooting war with another major power, the first thing that the “weaker” of the two would do is to level the playing field as much as possible – in this case, by taking out our space-based superiority. After all, depriving the US of GPS and spaced based imagery capabilities would have a non-trivial impact on our ability to wage a war “over there”. Think Kirk entering the Mutara Nebula. (“We daren’t follow them into the nebula, Sir! …. Our weapons would be useless!”) Granted, you may still have a general or admiral who will cry, “Full Power! Damn You!”, but I doubt it. Whatever the results of the shooting war on the ground, one effect that I haven’t heard much talk, but should be of supreme concern especially to those in the alt.space community, is that of MAE – the debris field created through the targeted destruction of numerous satellites could dwarf what is out there right now and make access to space virtually impossible for a long time. If you thought they had it tough in the Millenium Falcon going through the asteroid field, you have no idea…. Definitely a concern. While right now the debris problem is ugly, it appears solvable (at least for the engineering half of the problem–finding a way to get someone to pony-up for the cleanup looks daunting). Just retiring the biggest pieces (spent satellites and stages) would drastically lower the odds of future collisions. But if you have a war with massive use of ASATs, and now you have a ton of medium sized stuff. Which is a much tougher nut to crack. >space virtually impossible for a long time. This is almost certainly not true. While it is very probable that we would be deprived of the use of the affected orbits for a very long time we would be able to pass through the debris field with an acceptable level of risk to access higher orbits. This hardly makes me sanguine about the intentional, or even accidental , creation of a LEO debris field, but we should be careful not to overstate the case. What happened to the Virgin Galactic spaceship is a proof that you were right back in 2010. It isn’t hard being right in this context – all you need is a willingness to ignore the kool -aid and examine the facts.